10yr old Amish girl Sarah Hershberger flees U.S. to escape chemo. Exclusive Interview with her grandfather. I have an exclusive interview with Isaac Keim, grandfather of Sarah Hershberger, the 10 year old Amish girl who has fled the U.S. to escape being taken away from her parents and forced to do chemotherapy by Akron Childrens Hospital in Ohio, against her wishes. This story will make your blood boil. Donate to help the Hershberger family here! Related post: Watch the movie Cut Poison Burn. It’s about another family who was forced to give their son chemo. We did it! Akron Childrens Hospital has dropped their case and is no longer trying to take custody of Sarah! My new book Chris Beat Cancer: A Comprehensive Plan for Healing Naturally, published by Hay House, is a National Bestseller as ranked by USA Today, The Wall Street Journal, and Publishers Weekly! Get it on Amazon here, or anywhere books are sold. I've interviewed over 60 people who've healed all types and stages of cancer. Check them out here. Or use the search bar to find survivors of specific cancer types. I also created a coaching program for cancer patients, caregivers and anyone who is serious about prevention called SQUARE ONE. It contains the step-by-step strategies used by myself and everyone I know who has healed cancer with nutrition and natural, non-toxic therapies. Comment rules: The comments section is a place to share your thoughts, ask questions, and connect with other people in this community. If you are here to attack and argue, don't bother. Your comment will be deleted. I was diagnosed with stage IIIc colon cancer in 2003. After surgery I opted-out of chemo and used nutrition and natural therapies to heal. Today I’m healthy, strong, and cancer-free! If you’d like to learn how to help yourself heal or prevent cancer, you’ve come to the right place! GET MY NEW BOOK ON AMAZON! 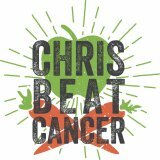 Disclaimer: The content of this website is based on research conducted by Chris Beat Cancer, LLC unless otherwise noted. The information is presented for educational purposes only and is not intended to diagnose or prescribe for any medical or psychological condition, nor to prevent, treat, mitigate or cure such conditions. The information contained herein is not intended to replace a one-to-one relationship with a doctor or qualified healthcare professional. Therefore, this information is not intended as medical advice, but rather a sharing of knowledge and information based on research and experience. Chris Beat Cancer, LLC encourages you to make your own health care decisions based on your judgment and research in partnership with a qualified healthcare professional. © 2019 Chris Beat Cancer. All Rights Reserved.